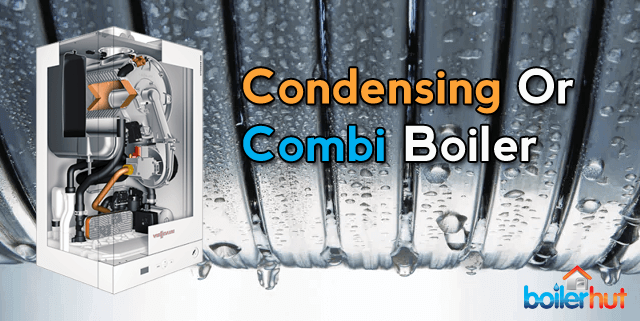 Condensing or Combi Boiler | Are all Modern Combi Boilers Condensing? We’ve had a lot of queries from clients asking about condensing or combi boiler, or what is the difference between a combi boiler and a condensing boiler. To make it clear from the start, those are incorrect questions because all modern combi boilers are condensing boilers. If your boiler has suddenly broken down after 20 years of daily use, and you’ve never had to shop around for a new boiler, we don’t blame you for being stumped at the moment and wondering whether to buy condensing or combi boiler. Which is why we’ve written this in-depth, factual article and tried to answer all questions, to help you make an informed decision. When people search condensing or combi boiler online, they probably mean “conventional” or combi boiler. Conventional boiler or regular boiler are just different names for an Open Vent boiler. Open Vent boilers have hot water cylinders and attic tanks. Which is what most of the average semi-detached family homes in the UK will have. Sealed System boilers are newer, and just have a cylinder for DHW (domestic hot water) storage. Along with modern combi boilers, all modern Open Vent and Sealed System boilers are also condensing boilers. Just to make it really simple, ALL boilers manufactured in 2018 are condensing boilers. We’ve done an extensive post on this subject which you can read by clicking on this link: What is a Combi Boiler? It looks at pros and cons of combi boilers and conventional boilers. We’ve also done a post on How a Combi Boiler Works. To summarize, “Combi” is short for combination boiler. Because it combines heating and hot water, you no longer need a separate DHW storage cylinder or attic tanks like you do for an Open Vent Boiler or a Sealed System Boiler. A condensing or combi boiler has a primary heat exchanger for heating, and a secondary plate heat exchanger for hot water. A basic combi boiler will suffice if your property has 1-2 bedrooms and 1 bathroom and there is no simultaneous hot water requirement from multiple taps. Even if your property is larger than that and you need on-demand hot water from multiple taps simultaneously, there are larger capacity combi boilers and storage combi boilers available too. In simpler terms condensing boilers recover more heat by recycling exhaust gases (mostly hot steam with some acidic content), which older non-condensing used to waste. It’s no rocket science that hot steam contains energy, as the inventor of the first ever steam engine found out. So, in modern condensing boilers, the hot flue gases go through a heat exchanger first before they exit through the flue outside. 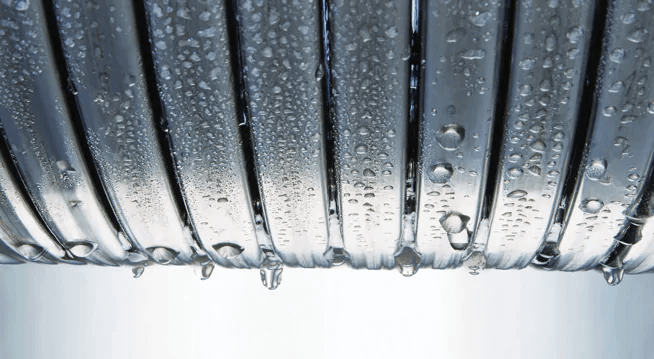 Condensing or Combi Boiler – Is that the Right Question? All combi boilers in 2018 are condensing boilers. However all condensing boilers in 2018 may not be combi boilers. If you’re even more confused than before when you started to read this post about condensing or combi boiler, do not panic. To better understand the distinction, we suggest reading our What is a Combi Boiler post again. In summary, there are different types of boilers; Open Vent, Sealed System and Combi boilers for different sized properties. Again, to emphasize: All boilers manufactured in 2018 or in the last 8-10 years are condensing boilers. So, whether you buy a Worcester Bosch or Viessmann, or Vaillant or Baxi or another brand of your choice, you can be rest assured in the knowledge that you are buying a condensing boiler. Unless someone convinces you to buy a 15 year old boiler, I think we’re safe here. So, why should you care about that? 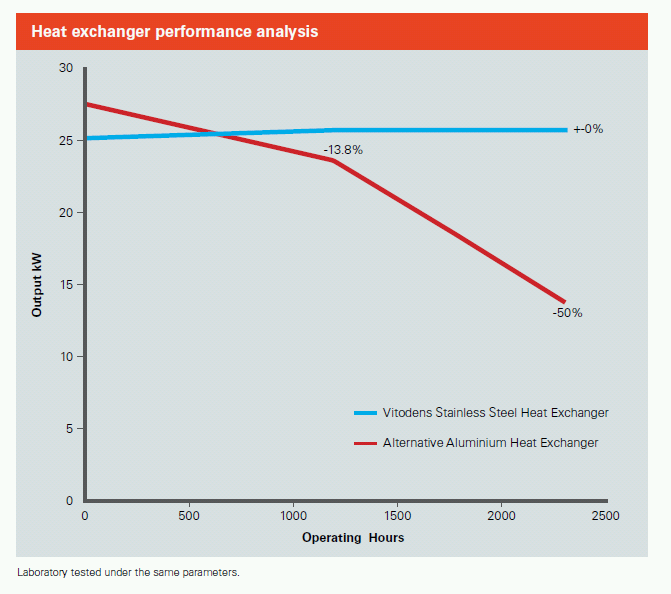 As you can see, the aluminium heat exchanger drops off in performance dramatically over time. So, over years of daily use, a Viessmann boiler will not only maintain its efficiency longer, it will also be more durable and resistant to corrosion and break down less often. In monetary terms, this means your investment in a Viessmann boiler will give much better returns. Whereas another brand with an aluminium will be ready to be replaced in half that time. And because Viessmann manufacture most of their components in-house, they can compete on price with their UK rivals. It’s really a no-brainer to invest in Viessmann boilers. 1) Are Viessmann spare parts readily available throughout the UK? Answer: Yes. Their UK headquarters are based in Telford, Shropshire, and all Viessmann spare parts are stocked at Plumbase and several other plumbing merchant locations around the UK. 2) With Brexit looming, is it safe to buy a Viessmann boiler? What will happen to them? Answer: Nothing. They will continue to function the same way as they are now, like several other European companies, because they have invested heavily in the UK. That is assuming Brexit even goes through. Acquired by the German company Bosch in 1992, Worcester Boilers have been the market leaders in the UK forever now. And for good reason. They are known for manufacturing high quality, efficient, reliable and durable boilers which have been the boiler of choice for UK consumers for decades now. 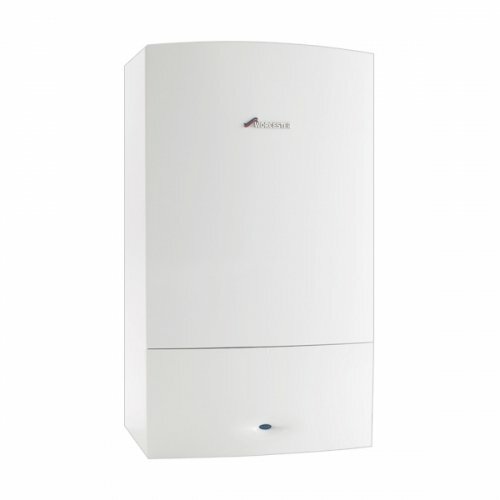 You simply cannot go wrong with buying a Worcester condensing or combi boiler. The only reason they’re second in this list is because of Viessmann’s stainless steel heat exchanger. 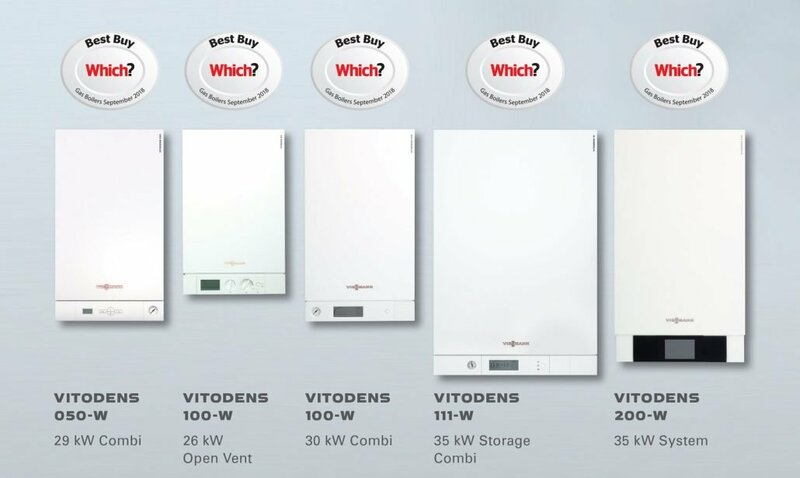 They have a vast boiler range suitable for almost every property size, except they don’t have wall mounted storage combi boilers for larger properties. They do have the floor-standing Greenstar Highflow series though. One of the reasons Worcester Bosch are so successful is because they’ve been present in the UK market forever, in fact the name “Worcester Boiler” is synonymous with central heating for generations. We do feel however the technology these boilers are running is a bit dated compared to the likes of Viessmann. Probably because they’re the market leaders and it’s the “If it’s not broken, don’t fix it” mentality, but in any case there is no way the aluminium heat exchangers inside these can compete with the ones from Viessmann. In any case, you still get your money’s worth when you buy a Worcester Bosch boiler. Vaillant is comparable to Viessmann and Worcester Bosch in terms of technology and boiler range, with Ideal and Baxi fast catching up. There are also the affordable condensing or combi boiler brands like Ferroli, Vokera etc. which are cheaper, but not up to par when it comes to quality. You’ve landed on this page because you’re obviously an educated, intelligent, internet-savvy buyer doing research before making one of the biggest buying decisions for your household. The boiler you choose will keep you and your loved ones comfortable and warm for the next 10-15 years at least. We hope we’ve given you all the relevant facts to make your decision easier. So, happy trails and choose wisely!